Ohio cropland values and cash rental rates are projected to decrease in 2015. According to the Ohio Cropland Values and Cash Rents Survey, bare cropland values in western Ohio are expected to decrease from 5.2 to 11.9 percent in 2015 depending on the region and land class. Cash rents are expected to decrease from 6.2 to 8.5 percent depending on the region and land class. Ohio cropland varies significantly in its production capabilities causing cropland values and cash rents to vary widely throughout the state. Generally speaking, western Ohio cropland values and cash rents differ from much of southern and eastern Ohio cropland values and cash rents. Factors affecting these rates are productivity and potential crop return, the variability of those crop returns, field size and shape, drainage, population density, ease of access, market access, local market prices, potential for wildlife damage, field perimeter characteristics and competition for rented cropland in a region. This fact sheet summarizes data collected for western Ohio cropland values and cash rents. The Western Ohio Cropland Values and Cash Rents study was conducted from February through May in 2015. The opinion-based study surveyed professionals with a knowledge of Ohio’s cropland values and rental rates. Professionals surveyed were farm managers, rural appraisers, agricultural lenders, OSU Extension educators, farmers, landowners and Farm Service Agency personnel. The study results are based on the 114 surveys returned, analyzed and summarized. Respondents were asked to group their estimates based on three land-quality classes: average, top and poor. Within each land-quality class, respondents were asked to estimate average corn and soybean yields for a five-year period based on typical farming practices. Survey respondents were also asked to estimate current bare ground cropland values, and cash rents negotiated in the current or recent year for each land-quality class. Survey results are summarized below for western Ohio with regional summaries (subsets of western Ohio) for northwest Ohio and southwest Ohio. The measures shown in the following tables are the summary of the survey respondents. The measures shown are the average (or mean), standard deviations indicating the variability of the data from the average measure, and range. Range identified in the tables consists of two numbers: the first is the average plus the standard deviation and the second is the average minus the standard deviation. Range represents the spread of land values and cash rents. When farmers and landowners are considering a parcel, it’s helpful to compare not only the average, but also the range measure. The range in these tables represents two-thirds of the responses in the survey, providing reliable data. Also realize land in a given region does not fall neatly into thirds of each land-quality class (average, top and poor). Typically, little acreage in a given county or region will fall into the top land category, which is usually large tracts of land with highly productive soils. Average land will typically be the majority of land in a given region or county, while poor land will tend to have lower productivity soils, steep slopes, poor drainage, smaller tracts or a combination of these factors. Ultimately, supply and demand of cropland for rent determines the cash rental rate for each parcel. The expected return from producing crops on a farm parcel and the variability of that return are the primary drivers in determining the rental rate. Many of the following factors contribute to the expected crop return and the variability of that return. Secondary factors may exist and could affect potential rental rates. These secondary factors are also listed below. Rent will vary based on expected crop return. The higher the expected return, the higher the rent will tend to be. Land that exhibits highly variable returns may have rents discounted for this factor. For example, land that is poorly drained may exhibit variability of returns due to late plantings during wet springs. Land (Soil) Quality: Higher quality soils translate into higher rents. Fertility Levels: Higher fertility levels often result in higher cash rents. Drainage/Irrigation Capabilities: Better surface and sub-surface drainage of a farm often results in better yields and higher potential cash rent. Likewise, irrigation equipment tied to the land will allow for higher yields, profits and rents. Size of Farm/Fields: Large farms/fields typically command higher average cash rent per acre due to the efficiencies gained by operators. Shape of Fields: Square fields with fewer “point rows” will generally translate into higher cash rents as operators gain efficiencies from farming fields that are square. Previous Tillage Systems or Crops: Previous crops and tillage systems that allow for an easy transition for new operators may enhance the cash rent value. Field Border Characteristics: Fields surrounded by tree-lined fence rows, woodlots or other borders affecting crop growth at the field edge will negatively impact yield and therefore should be considered in rental negotiations. Wildlife Damage Potential: Fields adjacent to significant wildlife cover including woodlots, tree lined fencerows, creeks, streams and such may limit production potential to border rows and should be considered in rental negotiations. Buildings and Grain Storage Availability: Access to machinery and grain storage may enhance the value of the cropland rental rate. Location of Farm (Including Road Access): Proximity to prospective operators may determine how much operators are willing to bid for cash rents. Good road access will generally enhance cash rent amounts. USDA Farm Program Measurables: Farms that participate in the USDA Farm Program and have higher “program yields” may command higher cash rents than non-program farms. Services Provided by Operator: Operators that provide services such as clearing fencerows, snow removal and other services may be valued by the landowner. This may even be a partial substitute for cash rent compensation. Conditions of Lease: Conditions placed on the lease by the landowner may result in fewer prospective operators and a lower average cash rent. Payment Dates: Leases that require part or all of the rent to be paid early in the year (up-front) may result in lower rental rates due to higher borrowing or opportunity costs for the operator. Reputation of Landowner/Operator: Reputations of the parties may play a part in the cash rental negotiations. A landowner with a reputation of being difficult to work with may see cash rents negatively affected by this reputation. Farmers with a similar negative reputation may have to pay higher rents. Special Contracts: Farms with special contract commitments may restrict the operator from changing crops based on market conditions. This may negatively impact cash rents. There may also be contracts that positively affect cash rents such as high value crop contracts or contracts for receiving livestock manure. The following sections of the fact sheet detail the 2015 survey results divided into western, northwest and southwest Ohio. Tables 1 through 3 also detail projected changes for long-term land value and cash rents, which will be explained later in the fact sheet in the “Additional Survey Results” section. Survey results from western Ohio are summarized in Table 1. See Figure 1 for counties included in this region. Additional results, including year-over-year percentage change, rent per bushel of corn, and rent as a percentage of land value, are summarized in Tables 4 and 5. Survey results for average producing cropland show an average yield to be 173.2 bushels of corn per acre. Results show the value of average cropland in western Ohio was $7,884 per acre in 2014. According to survey data, average producing cropland is expected to be valued at $7,315 per acre in 2015. This is a projected decrease of 7.2 percent. Average cropland rented for an average of $213 per acre in 2014 according to survey results. Average cropland is expected to rent for $199 per acre in 2015 which amounts to a 6.9 percent decrease in cash rent year-over-year. This 2015 rental rate projection of $199 per acre equates to a cash rent of $1.15 per bushel of corn produced. Rents in the average cropland category are expected to equal 2.8 percent of land value in 2015. Survey results indicate top performing cropland in western Ohio averages 205.1 bushels of corn produced per acre and the average value of top cropland in 2014 was $9,727 per acre. According to this survey, top cropland in western Ohio is expected to be valued at $9,190 per acre in 2015. This is a projected decrease of 5.5 percent. Top cropland in western Ohio rented for an average of $281 per acre in 2014 according to survey results. Top cropland is expected to rent for $259 per acre in 2015 (a decrease of 7.7 percent) which equates to a cash rent of $1.26 per bushel of corn produced. Rents in the top cropland category are expected to equal 3.1 percent of land value in 2015. The survey summary shows the average yield for poor performing cropland equals 140.5 bushels of corn per acre, with the average value of poor cropland as $6,272 per acre in 2014. According to survey data, poor producing cropland is expected to be valued at $5,673 per acre in 2015. This is a decrease of 9.6 percent. Poor cropland rented for an average of $159 per acre in 2014 according to survey results. Cash rent for poor cropland is expected to average $147 per acre in 2015 which amounts to an 8 percent decrease in cash rent year-over-year. This 2015 rent projection of $147 per acre equates to a cash rent of $1.04 per bushel of corn produced in 2015. Rents in the poor cropland category are expected to equal 2.7 percent of land value in 2015. * Range—One standard deviation above and below the average (mean). Approximately two-thirds of the responses fall within this range. Survey results from northwest Ohio are summarized in Table 2. See Figure 2 for counties included in this region. Additional results, including year-over-year percentage change, rent per bushel of corn and rent as a percentage of land value, are summarized in Tables 4 and 5. Yields for average producing cropland average 168.7 bushels of corn per acre or 49.9 bushels of soybeans per acre. Results show the value of average cropland in northwest Ohio was $7,392 per acre in 2014. According to survey data, average producing cropland is expected to be valued at $6,718 per acre in 2015. This is a projected decrease of 9.1 percent. Average cropland rented for an average of $187 per acre in 2014 according to survey results and is expected to rent for $175 per acre in 2015 which is a year-over-year decrease of 6.2 percent. The 2015 rental rate of $175 per acre equals $1.04 per bushel of corn produced. Rents in the average cropland category are expected to equal 2.4 percent of land value in 2015. Survey results indicate top performing cropland in northwest Ohio averages 202.1 bushels of corn per acre or 62.4 bushels of soybeans per acre. Results also show the average value of top cropland was $9,298 per acre in 2014. According to this survey, top producing cropland in northwest Ohio is expected to be valued at $8,733 in 2015. This is a projected decrease of 6.1 percent. Top cropland in northwest Ohio rented for an average of $251 per acre in 2014 and is expected to rent for $234 per acre in 2015 (a decrease of 6.7 percent) according to survey results, which equals $1.16 per bushel of corn produced. Rents in the top cropland category are expected to equal 2.6 percent of land value. The survey summary shows the average yield for poor performing cropland in northwestern Ohio equals 135.5 bushels of corn per acre or 38.4 bushels of soybeans per acre. Results also show the average value of poor cropland was $5,797 per acre in 2014 and is expected to average $5,105 per acre in 2015. This is a projected decrease of 11.9 percent. Poor cropland rented for an average of $138 per acre in 2014 and is expected to average $128 per acre in 2015 according to survey results (a 7 percent decrease) which equals $0.94 per bushel of corn produced. Rents in the poor cropland category are expected to equal 2.2 percent of land value in 2015. 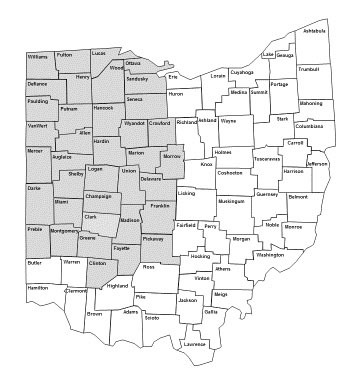 The northwest region for the purposes of this survey includes: Williams, Fulton, Lucas, Ottawa, Defiance, Henry, Wood, Sandusky, Paulding, Putnam, Hancock, Seneca, Van Wert, Allen, Hardin, Wyandot, Crawford, Marion and Morrow counties and parts of Richland, Huron and Erie counties as shown in Figure 2. Counties bordering this region to the south will also contain land parcels with cropland value and rental rate characteristics similar to northwest Ohio data. Survey results from southwest Ohio are summarized in Table 3. See Figure 3 for counties included in this region. Additional results, including year-over-year percentage change, rent per bushel of corn and rent as a percentage of land value, are summarized in Tables 4 and 5. Yields for average cropland equal 176.4 bushels of corn per acre. Results show the value of “average” cropland in southwest Ohio was $8,230 per acre in 2014. According to survey data, average producing cropland is expected to be valued at $7,734 per acre in 2015. This is a projected decrease of 6 percent. Average cropland rented for an average of $233 per acre in 2014 and is expected to rent for $216 per acre in 2015 according to survey results (a 7.4 percent decrease) which equals $1.22 per bushel of corn produced. Rents in the average cropland category are expected to equal 3.0 percent of land value in 2015. Survey results indicate top performing cropland in southwest Ohio averages 207.1 bushels of corn per acre or 64.7 bushels of soybeans per acre. Results also show the average value of top cropland was $10,019 per acre in 2014. According to this survey, top producing cropland in southwest Ohio is expected to be valued at $9,501 per acre in 2015. This is a projected decrease of 5.2 percent. Top cropland in southwest Ohio rented for an average of $301 per acre in 2014 and is expected to rent for $277 per acre in 2015 according to survey results which is a year-over-year decrease of 8.2 percent. The 2015 rental rate of $277 per acre equals $1.34 per bushel of corn produced. Rents in the top cropland category are expected to equal 3.2 percent of land value in 2015. The survey summary shows the average yield for poor cropland in southwestern Ohio equals 143.8 bushels of corn per acre. Results also show the average value of poor cropland was $6,596 per acre in 2014. According to survey data this poor producing cropland is expected to be valued at $6,061 per acre in 2015. This is a decrease of 8.1 percent. Poor cropland rented for an average of $175 per acre in 2014 and is expected to average $160 per acre in 2015 according to survey results (an 8.5 percent decrease) which equals $1.11 per bushel of corn produced. Rents in the poor cropland category are expected to equal 2.8 percent of land value in 2015. 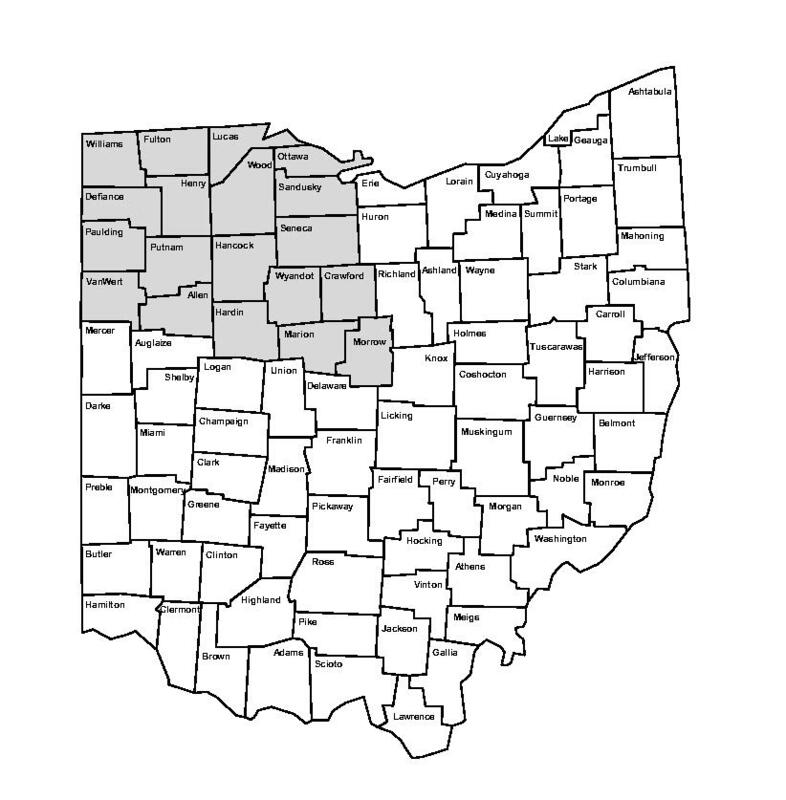 The southwest region for the purposes of this survey includes: Mercer, Auglaize, Shelby, Logan, Union, Delaware, Darke, Miami, Champaign, Clark, Madison, Franklin, Preble, Montgomery, Greene, Clinton, Fayette and Pickaway counties and parts of Butler, Warren, Brown, Highland and Ross counties as shown in Figure 3. Counties bordering this region to the north will also contain land parcels with cropland value and rental rate characteristics similar to southwest Ohio data. Survey respondents were asked to give their best estimates for long-term land value and cash rent change, as well as projections for mortgage and operating loan interest rates for 2015. The average estimate of cropland value change in the next five years for western Ohio (Table 1) is a decrease of 10.58 percent (for the entire five-year period). Responses for the five-year cropland value change ranged from an increase of 10 percent to a decrease of 50 percent, which is a considerably large range. Pasture land value—projected 2015, improved, non-rotation. Also, check with your local OSU Extension Office for local land value/rental survey summaries. For additional information on farmland lease issues see the Department of Agricultural, Environmental and Development Economics (AEDE) Farm Management webpage.